Choosing the World’s Greenest Business Card was a no brainer for me. It is an extension of my brand, which is rooted in sustainability. 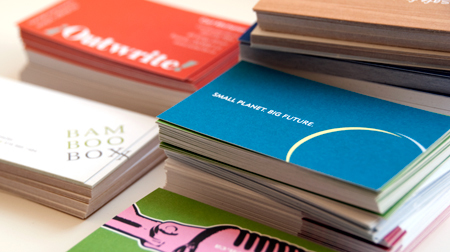 My cards always receive compliments, and the fact that it is printed on FSC certified paper often sparks a conversation. I highly recommend these cards to any green business owner! And the price is unbeatable! I contacted traffic for the super-green printing, but they exceeded my expectations in a huge way with the design and concept for my business card. It's truly unique, everyone comments on it, and I've adopted the concept as the core of my branding. I am really impressed with traffic design—guilt-free paper business cards and excellent designs. In my hunt for environmentally-conscious print materials, I assumed I would always have to compromise, either on quality or on cost. That was before I met Bernard and TWGBC. I run two businesses, and cards for both were done through TWGBC. I am proud to tout cards that were not only printed responsibly, but also represent the attention to quality and precision that I and my businesses demand. If you have an event and are looking for sponsorship, please get in touch with us and we'd be pleased to discuss. I was very impressed by Bernard Hellen's assessment of my marketing needs and he turned around a great design under an incredibly tight deadline. The business card itself is very impressive: clean design and layout, plus the card stock is lovely and thick to the touch. When networking, it's all about making a connection and creating a strong, positive impression. When I hand over my personalized World`s Greenest Business Card I am presenting myself as both business and environment 'savvy'.